Yesterday was the Scotland match, and thankfully the weather couldn’t have been a greater contrast to that of the Italy game – beautiful warm sunshine which we’ve learnt has been amongst the best weather in the Faroes for many years. The Tartan Army provided another difference to the Italian fans earlier in the week. 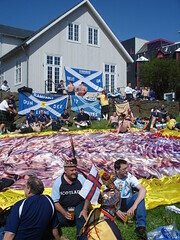 They were louder, more colourful, in greater number – there must have been perhaps a thousand in the stadium – and they made a much more substantial contribution to the licenced trade sector of the Faroese economy, filling just about every bar in the centre of Torshavn. Sailing over to Toftir from Torshavn was a lively trip, with the Scotland fans in full voice and engaging in healthy banter with the bemused Faroese fans, whose only football chant seemed to be the somewhat optimistic “You’ll be rolling down the mountain when we win”. 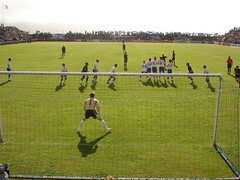 And win they didn’t, with Scotland banishing the memories of two embarassing draws at the spectacular hilltop stadium. Two first half goals sealed the victory, although the Faroese played well towards the end of the match and were very unlucky not to score, hitting the woodwork twice. Our week is drawing to a close as we head home tomorrow. It’s been a grand holiday in an absolutely lovely place. The people have been very friendly, freely engaging in conversation at bus stops or in pubs, far from the stereotype of Scandinavian reservedness I was expecting. The scenery has been lovely, the weather amazing, and I am even coming back with a healthy suntan. Not bad for a rocky outcrop halfway to Iceland. Thursday 7 June 2007 in Travel. They were all over you! Your boys were lucky to get out alive. Scandinavian reservedness? Did you see Denmark v Sweden?